What was the North Korea hoping to gain Tuesday by firing at an inhabited South Korean island? According to the WSJ: "Privately, military officials said they believe the artillery attack on South Korea is likely linked to the North Korean succession and could be another attempt by Kim Jong Il's son, Kim Jong Eun, to shore up support among hardliners in the military." On the other hand, Bloomberg reports: "North Korea’s attack on a South Korean island, along with its disclosure of nuclear advances, is part of a strategy to draw the U.S. back to the negotiating table, analysts in the U.S. and Asia say." Here's Jotman's timeline of recent events concerning the crisis on the Korean Peninsula. 2008 12 --- - Last Six Party Talks held with North Korea. North Korea pledges to abandon nuclear program. 2009 02 20 - Reports that Kim Jong Un next in line to rule North Korea. 2009 04 --- - North Korea launches rocket, Six Party Talks terminated by US and Japan. 2009 11 10 - North Korean sailor killed in naval skirmish with South (first skirmishes in ten years). 2009 11 18 - Obama, visiting South Korea, will send envoy to North Korea for bilateral talks. 2010 03 10 - KDIC warns North Korean suicide teams might use mini-submarines to attack the South. 2010 03 26 - South Korean patrol ship Cheonan sinks, killing 56 sailors. 2010 03 31 - China supports US call for sanctions against Iran. 2010 05 18 - Seoul blames North Korea for torpedoing of South Korean patrol ship Cheonan. 2010 05 24 - Seoul sanctions North Korea trade, resumes FM broadcasts to North. 2010 05 26 - North Korea cuts naval hotline used to prevent clashes on disputed sea border. 2010 06 --- - UN Security Council resolution backs curbs on loans to North Korea. 2010 06 21 - Clinton and Gates visit South Korea together. 2010 06 22 - Beijing first protests planned US-South Korean naval exercise in Yellow Sea. 2010 07 01 - China stages military exercise in Yellow Sea. 2010 07 22 - US planning to block North Korean elite's banking funds. 2010 07 25 - Joint US-South Korea "indomitable will"military exercise in Yellow Sea. 2010 08 16 - U.S. and South Korea hold "Ulchi freedom fighters" exercise. 2010 08 20 - China warns US that joint US-South Korea exercise will anger Chinese, North Korea. 2010 09 06 - North Korea frees 7 detained South Korean fishermen. 2010 09 07 - Kim Jong Un appointed successor in North Korea. 2010 10 26 - Joint US-South Korean naval exercises delayed indefinitely due to "scheduling problems." 2010 11 10 - Obama arrives in South Korea for G20 summit. 2010 11 20 - US scientist Sigfried Hecker returns from tour of new North Korean nuclear facility. 2010 11 23 - North Koreans call South Korea Command, demanding South halt a military exercise. - - - - - - - - - North Korea fires 200 artillery shells at Yeonpyeon Island, killing two. - - - - - - - - - South Korea returned fire "almost immediately." Exchange of fire. - - - - - - - - - North Korean news agency says "South recklessly fired into our sea area." 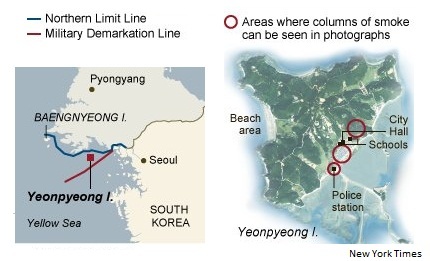 - - - - - - - - - South Korea says a battery on Byeongryeong (8 miles off coast) fired into sea. - - - - - - - - - South Korea's leader threatens "massive retaliation" if it faces "further provocations." - - - - - - - - - Stock markets, metal and oil prices fall on Korea situation, Ireland bailout, Portugal worries.